Make no mistake about it, these obsolete motor oils are not hard to find. They are not dead stock covered with dust, hidden in a back room on top of a cooler in a Chokoloskee, Florida bait shop. Instead, (as shown in Figure 2) they are eye level products served up to consumers at many high traffic convenience stores PQIA visited in Miami, Opa-Locka, Dania, West Palm Beach and other areas in Florida. And with shelves loaded with these obsolete motor oils, there is little wonder why a consumer would think it’s all good. But truth be told, these motor oils are not good for nearly all cars currently on the road. In fact, some can cause damage. 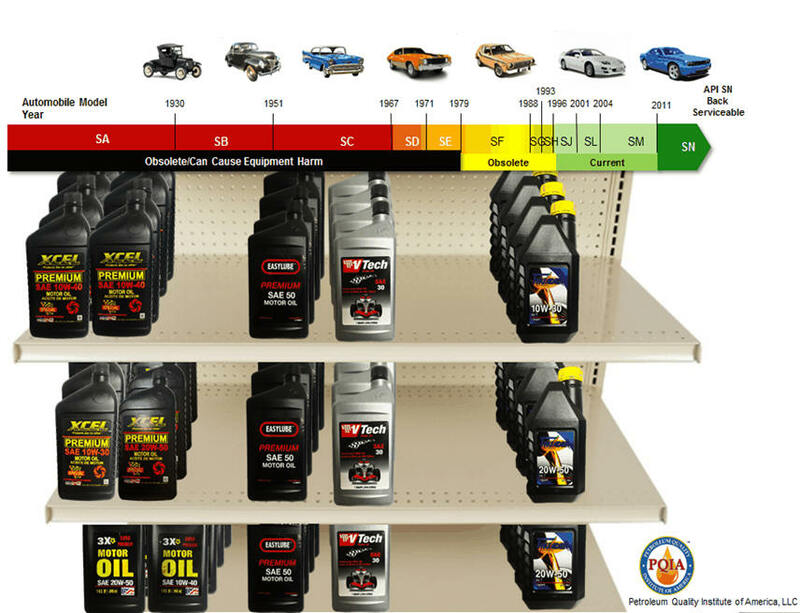 With that in mind, how do you think consumers would react if the motor oils on store shelves were required by law to be identified under a prominently displayed sign at the top of the shelf that corresponded to the vehicle model years the products were meant to service? (See Example in Figure 3) Do you think many would reach for, and buy motor oils under the section labeled “Not suitable for use in gasoline-powered engines built after 1930. Use in more modern engines may cause unsatisfactory performance or equipment harm?” You can be sure very few, if any would. But this is unfortunately not the case. No such identification or delineation of motor oils is required by law in the State of Florida to protect consumers from products that are obsolete and can cause equipment harm. As a result, obsolete motor oils are often the only products on the shelves, or sit side-by-side with motor oils that meet current specifications at many of the convenience stores PQIA visited in Florida. Further, the prices of these products are often just under motor oils meeting current specifications. Because of this, the labels on obsolete motor oils can be extraordinarily deceiving, especially when these products are labeled as multigrade API SA/SB. As noted in the previous article PQIA published about the motor oils in Florida, by definition, API SA motor oil cannot be a multi-viscosity grade product. Consumers beware. Beware of obsolete motor oils on the shelves at convenience stores in Florida that are adorned with enticing labels, language, and viscosity grades suggestive of state-of-the-art technology. These oils are anything but. In fact, some of them can cause harm to your engine.